I was born in the ’80s and grew up in the ’90s. I was part of the generation of video games and the last generation to not have computers in all classrooms. We brought hip-hop and grunge music to the mainstream and, of course, we had our sports stars. We idolized the likes of Barry Sanders, Michael Jordan and Wayne Gretzky in their respective sports, and in baseball, one man stood above all: Ken Griffey Jr. To many people who grew up in my generation, Junior was the epitome of who you wanted to be on the baseball diamond. I remember arguing yearly with teammates to see who would get to wear his number 24 on our jerseys. His Nike cleats were best-sellers yearly, but it was his love for the game that made kids, such as myself, emulate his every move. This week, Ken Griffey Jr. was elected into the MLB Hall of Fame with the highest percentage of votes ever, 99.3%. Three bozos left him off of their ballots, but we won’t get into that…. His backwards baseball cap. Junior made wearing ball caps backwards the cool thing to do in batting practice and in everyday life. Today’s generation has flat-brims and sideways hats but nothing pissed Baby Boomers off more than wearing your hat backwards in the ’90s. His Nike cleats/sneakers. They were top-sellers during every baseball season. His spikes were baseball’s Jordans. The Catch. The catch he made on April 26, 1990, against the Yankees. Jesse Barfield hit a would-be home run off Randy Johnson until Griffey Jr ran it down, leaped and then showed the ball to the crowd while running back to the dugout. It will forever be his trademark defensive play. Ken Griffey Jr. Presents Video Games. The video games were nowhere near the quality that today’s games were but there was something so cool about playing the game with your favorite player on it. The negative was that all of the players were fake … except Griffey of course. Griffey’s home run derby. He was the only reason we needed to watch the home run derby every year. We all expected a show from him, and Griffey rarely disappointed. He shined on this big stage. First-to-home. 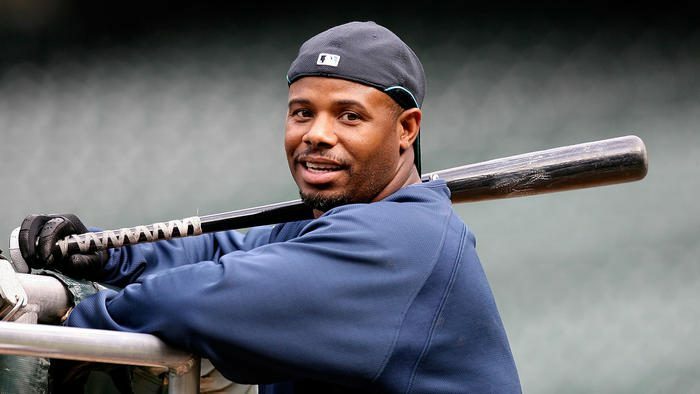 In the 1995 Divisional Round, Griffey tied the game with a single in the 11th inning, and then Edgar Martinez hit a double which allowed Junior to hustle around the bases and score from first to clinch the series. His nickname. Can you get any cooler than the nickname “The Kid”? It endeared him to the youth as much as his skill on the field endeared him to older fans. 1989 Upper Deck Rookie Card. The baseball card that every collector wanted and every kid needed for his collection. I am sure most of you are wondering if you still have it packed up somewhere. They are currently selling on ebay for around $500. His swing. Need I say more? Everybody wanted it but nobody could duplicate it. It was perfection.